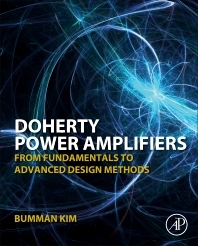 Doherty Power Amplifiers: From Fundamentals to Advanced Design Methods is a great resource for both RF and microwave engineers and graduate students who want to understand and implement the technology into future base station and mobile handset systems. The book introduces the very basic operational principles of the Doherty Amplifier and its non-ideal behaviors. The different transconductance requirements for carrier and peaking amplifiers, reactive element effect, and knee voltage effect are described. In addition, several methods to correct imperfections are introduced, such as uneven input drive, gate bias adaptation, dual input drive and the offset line technique. Advanced design methods of Doherty Amplifiers are also explained, including multistage/multiway Doherty power amplifiers which can enhance the efficiency of the amplification of a highly-modulated signal. Other covered topics include signal tracking operation which increases the dynamic range, highly efficient saturated amplifiers, and broadband amplifiers, amongst other comprehensive, related topics. Bumman Kim (M'78–SM'97–F'07) received the Ph.D. degree in electrical engineering from Carnegie Mellon University, Pittsburgh, PA, in 1979. In 1981, he joined the Central Research Laboratories, Texas Instruments Incorporated, where he was involved in development of GaAs power field-effect transistors (FETs) and monolithic microwave integrated circuits (MMICs). He has developed a large-signal model of a power FET, dual-gate FETs for gain control, high-power distributed amplifiers, and various millimeter-wave MMICs. In 1989, he joined the Pohang University of Science and Technology (POSTECH), Pohang, Gyungbuk, Korea, where he is a POSTECH Fellow and a Namko Professor with the Department of Electrical Engineering, and Director of the Microwave Application Research Center. He is involved in device and circuit technology for RF integrated circuits (RFICs) and PAs. He has authored over 300 technical papers. Prof. Kim is a member of the Korean Academy of Science and Technology and the National Academy of Engineering of Korea. He was an associate editor for the IEEE TRANSACTIONS ON MICROWAVE THEORY AND TECHNIQUES. He was a Distinguished Lecturer of the IEEE Microwave Theory and Techniques Society (IEEE MTT-S) and an IEEE MTT-S Administrative Committee (AdCom) member.